Now it’s easier than ever to add a professional backdrop to your performance or display with Global Truss’ new Global Screen. 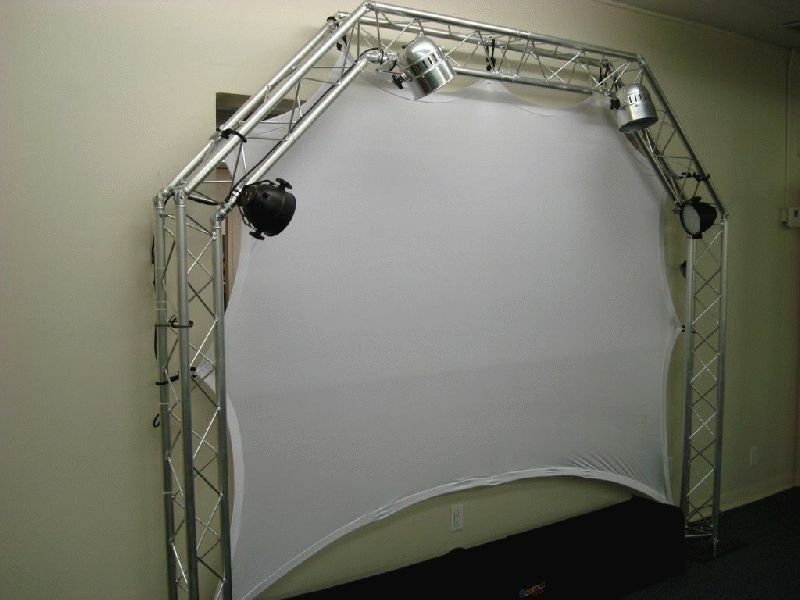 A portable, flexible white Lycra screen, the Global Screen fits easily and securely into trussing, making it ideal for DJs, performers, small productions, trade shows, presentations and corporate events. A snap – literally – to install, the Global Screen is large enough to make an impressive impact, yet it’s lightweight and compact for ease of portability. The 4-way stretch Lycra fabric can accommodate any size and almost any shape, from 8- to 10-feet by 6- to 8.5-feet, and can be used either vertically or horizontally. With bungee cords and clips holding the screen securely to the truss at 12 anchor points, the Global Screen can be installed quickly, yet it is secure and stable. Unlike screens that have only 8 anchor points, the Global Screen’s extra 4 anchors alleviate stress that pulling puts on the fabric, which helps to make it more durable and longer-lasting. The extra anchors also stretch the fabric more evenly over the truss supports, preventing rippling and creating a smoother surface on which to project. The white fabric, which can be projected on from the front or rear, makes a perfect backdrop for video presentations, slideshows and ambient color displays. So rugged and weatherproof is the Global Screen, that it can even be used outdoors. “With its stretch fabric, portability and durability, the Global Screen is an indispensable tool for anyone involved in DJ-ing, emceeing, small productions, or designing trade show booths or displays of any kind,” said Ken Kahn, General Manager of Global Truss America. “It’s flexible enough to fit almost any type of performance or display. Plus, it’s easy to transport and set up, and it can be used just about anywhere – indoors or out.